Well, I cracked open my first bottle of my Lambic #2. This beer was made with East Coast Yeast’s Bug Farm. All I can say is, what a difference the bugs make. If you have not had a chance to try East Coast Yeast’s products for sours, please do. I think they are far superior to what you get from Wyeast or White labs. Tasting — Pours a straw yellow, hazy, faint bubbles on the glass, but very little carbonation. The aroma is musty, with that traditional “horsey” smell with a sharp lemon tang. No hops. The beer is thin, very sour. There is a sharp lemon/citrus taste, with some of the barnyard/grass and mineral notes. It finishes with long tart bite. 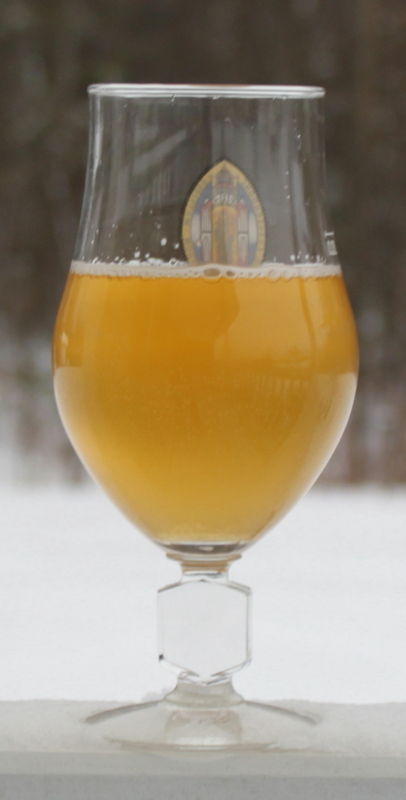 Critique — This is much more what I had in mind when I made my first lambic. Sharp, tart, complex, very refreshing. I am very happy with the beer. However, I am not happy with my carbonation. Carbonation is going to add more of a bite, which this beer does not need, but it also gives you that perfume of the beer when you first smell it. I don’t want a ton, but some noticeable fizz would be nice. I bottled this, and it was dead flat, so I added more sugar then I usually do. This time I pitched 1g of rehydrated champagne yeast per gallon of beer with 1 oz of dextrose per gallon, and all I got was very slight bubbles on the glass. I am very happy with the beer, and am really looking forward to the other versions, but I am still drawing a blank on how to carbonate these. Hopefully the wild bugs will do their job over the next few weeks to finish carbonating this beer.